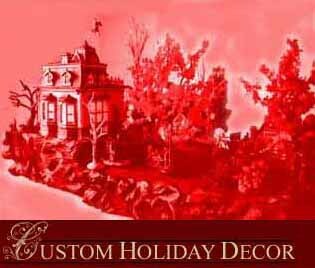 CCExpressions specializes in creating unique holiday displays. If you're a collector of Department 56 or other lighted houses who is looking for a custom made base on which to display your village, we can help. The links above will take you to examples of Christmas and Halloween villages. CCExpressions also serves as a virtual gallery for some of Christine Chilton's oil paintings. If you are interested in having Christine design a holiday display for you, or are interested in purchasing her artwork, please send her email. Last updated 06 January 2003. All images copyright 2003 by Christine Chilton.